Natural sweeteners, high-pressure pasteurization, resistant starch and robots are modern marvels changing the way we make food. Breakthrough innovation comes slowly and cautiously to the food and beverage industry. Springing a blonde Oreo on the consuming public is a lot easier, a surer business bet and more acceptable than, say, using radiation to kill pathogens in meat. Or growing a hamburger in a petri dish. But breakthroughs continue in the R&D centers of both ingredient suppliers and equipment manufacturers. High-intensity sweeteners were unheard of until saccharin was synthesized in 1879 -- although it took another 70 years to come into widespread use, and then it was followed by a slew of sugar substitutes. That's about the same time (the 1950s) that clean-in-place relieved the food industry of disassembly of equipment for sanitizing. Some seemingly good recent ideas have failed to catch on. No research has shown that irradiation harms food or humans, but try selling that to the general public. Carbon monoxide can keep meat looking fresh longer, but that process got a black eye five or so years ago. Lean finely textured beef could feed a lot of America's undernourished school children, and genetically engineered Golden Rice could save the rest of the world. But all those technologies will have to wait a while longer. We have identified a handful of technologies that have persevered through some initial resistance and are starting to have an impact on both the product development and plant operations sides of the food and beverage industry. Until recently, American consumers had schizophrenic feelings about non-nutritive sweeteners. They knew obesity was becoming America's No. 1 health problem and that added sugars played a key role. But they distrusted "chemicals" with names like acesulfame potassium and benzoic sulfilimine (saccharin). As is so often the case, the damning scientific studies got more press than the ones that deemed the ingredients safe. FDA's acceptance of that GRAS claim came at the very end of 2008. It was a big event for the food & (especially) beverage industry, says Mark Brooks, global business director of Truvia consumer products for Cargill Inc., Wayzata, Minn. "Not many brand-new ingredient products come on the market." It probably doesn't need to be said anymore, but Truvia is Cargill's consumer/tabletop stevia-based sweetener – and is quite a success story. And Cargill was one of those original petitioners, teamed with Coca-Cola Co. The other petition was from Whole Earth Sweetener Co., a unit of Merisant Co., and PepsiCo. The 2008 "non-objection" from FDA came after six years of development and consumer research at Cargill, which confirmed demand for a natural sweetener and ingredient suppliers' ability to provide a palatable ingredient. "We've invested more than 80,000 man-hours into its development," Brooks notes. Even so, stevia was not an overnight success. "At that time, no food formulators had learned about stevia when they were in college," he continues. It was not a drop-in replacement for sugar or any non-nutritive sweeteners, so formulations needed to be adjusted. Other hurdles included convincing processors they needed to change sweeteners, weighing the risk vs. the perceived rewards to consumers, and if consumers would understand the new ingredient. "But consumers caught on very quickly," he said. Stevia has its own taste profile, as any sweetener does. There is some bitterness, especially a licorice-like taste. The onset and lingering of sweetness were easily adjusted. But three strategies helped its acceptance. Cargill's plan was to immediately launch the consumer product, Truvia, with a heavy marketing campaign. The visibility and eventual success of the tabletop product emboldened processors to use stevia in their products. Cargill encouraged co-branding, so many processors carried "sweetened with Truvia" on their packages. The other two strategies evolved among processors. Most, like Coca-Cola, launched new niche products, such as Sprite Green, warily, not trusting their core brands to the new sweetener. Now, however, some are switching products over to stevia with neither fanfare nor trepidation, they are so comfortable with the sweetener. Brooks says Coca-Cola has changed the core brand Sprite to stevia in much of the world (although not yet in the U.S.). The other processor strategy was to launch reduced- but not zero-calorie products, such as Tropicana's Trop 50 orange juice. Beverage makers especially had perceived consumer interest in products that carried a little sugar, and stevia does blend well with sucrose. Consumers finally had a non-nutritive sweetener made from a plant. But stevia wasn't alone for long. History repeated itself with the arrival of monk fruit extract, also known as luo han guo or Buddha fruit. This China native has been around since at least the 13th century and, like stevia, it adds zero calories and is considered natural. You never saw it outside of a natural products show until London-based Tate & Lyle made it the company's big announcement at the 2011 IFT Food Expo. Introduced under the name Purefruit, it's actually a refinement of a monk fruit extract supplied by BioVittoria Ltd., a New Zealand company that had been marketing it for a few years and had greatly expanded the fruit's propagation. BioVittoria successfully proclaimed its Fruit-Sweetness-branded monk fruit concentrate as GRAS in January 2010. The company claims to have locked up 90 percent of the world's supply of monk fruit. Like Cargill did with stevia, Tate & Lyle supplied BioVittoria's monk fruit to McNeil Nutritionals LLC, a Johnson & Johnson subsidiary, for Nectresse, a consumer/tabletop sweetener that is in national distribution. That deal is similar to one decades earlier that put Tate & Lyle's sucralose into McNeil's Splenda. Perhaps hedging its earlier stevia bet, Blue California, Rancho Santa Margarita, Calif., introduced BlueSweet luo han guo extract. "It's a really good product but has a different profile than stevia," Cecilia McCollum, executive vice president, explained to us in an earlier story. U.S. Niutang Chemical Inc., Chino, Calif., also has demonstrated samples of a monk fruit sweetener called Fruit20 and Fruit50, denoting the percentages of the key monk fruit sweetening agent. Pasteurization is a wonderful thing – thank you, Louis Pasteur and Nicolas Appert. But being "cooked" has its bad points. Gentleness is not one of the attributes of most heat-pasteurization processes. Pressure of 87,000 psi may not sound gentle, either, but its effects on the texture of foods is negligible; its impact on pathogens is deadly. That's the kind of pressure applied in high-pressure pasteurization (HPP) systems, which are cold-pasteurizing meats, juices, ready-to-eat meals and other premium food products that would suffer under high-temperature pasteurization. An HPP system packs packaged food products into torpedo-like cylinders that are moved into water-filled chambers. As the water pressure is raised, microorganisms such as salmonella and listeria are killed by collapsing their cell walls. The food product is largely unaffected. But its packaging must be tough. It's a more expensive process than retorting, but it's gentle and adds no ingredients (such as antimicrobials), thereby meeting current consumer demands for minimal processing and fewer ingredients. The Giordano family had been selling food in Philadelphia for more than 100 years, supplying corned beef, roast beef, pastrami and other deli meats. Those delicately cooked meats are susceptible to bacteria, such as listeria. Sure enough, one day in 2005, "We had a single product show up with listeria in Georgia. All told, that incident cost me $4 million," recalls Guy Giordano, president of what is now Vincent Giordano Corp. "I don't even think it was our fault, but there's no way to be sure." But he didn't want it ever to happen again. Not for the public health danger. Not for the threat such an incident would pose to keeping the company in his family. So he bought an HPP system from Hiperbaric and helps pay for the machine by treating nearby companies' products as a toll processor. Girodano's machine holds 420 liters of water in its cylinder, which Giordano claims was the largest available at that time. Up to 500 lbs. of product can be loaded onto the carriers, which travel horizontally into the chamber, where the pressure is created. While food safety is the primary goal, it also extends shelf life – Giordano estimates up to four or five times. The system was up and running in late 2010. "Meats have traditionally been No. 1, but 'fresh' juices have come on very strong in the past two years," says Jaime Nicolas, director of Hiperbaric North America, Miami, Fla. He's the son of the company founder, who remains in Spain, where the company began and maintains its R&D and manufacturing. Hormel Natural Choice products – deli meats, bacon, chicken strips and sausages – employ the process and claim "100 percent natural, no preservatives, all-natural taste" on their labels. Hormel was an early adopter of HPP and did much to advance the technology. The company has machines from both Hiperbaric and Avure Technologies. While Hormel has the volume to rationalize its HPP machines, Giordano in Philadelphia does not. "It's an amazing and reliable technology – but a little expensive," he admits. So he set up a standalone company, Safe Pac as a toll processor to take on as much contract work as possible to pay off the machine. "It can do deli salads, entrees and side dishes, soups, almost any ready-to-eat food product in a sealed package," he says. He even runs some products for competitors, who want to make an "all-natural, no preservative" claim on their packages. 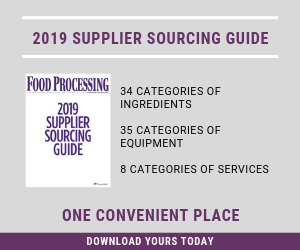 A number of other food processors and contract manufacturers that have invested in HPP machines also are offering toll processing on their systems. Since its "discovery" in the early 1980s, resistant starch has been slowly creeping toward mainstream recognition. And it just might be on the verge of that kind of breakout. Resistant starch is a unique form of carbohydrate that, in formulation, behaves like starch, but when it hits the digestive system, it acts like fiber. It is resistant to digestion (hence the name) and provides a wealth of health benefits – but only about half the caloric content of nonresistant starch. Like a fiber, it helps lower cholesterol, reduce cancer of the digestive system and protect against cardiovascular disease. Resistant starch is especially beneficial in helping manage diabetes and its precursor, insulin resistance. It does this by regulating blood sugar as well as dietary caloric intake through its propensity to increase satiety of a meal. While resistant starch is a natural component found in bananas, parsnips, plantains, potatoes, yams and most legumes like beans, peas and lentils (but not soy), it also is in grains, especially barley, rice and high-amylose corn. It is in three natural forms, RS1, RS2 and RS3. Each form has to do with the structure and function of the starch molecule. As with other starches, resistant starch consists of a long chain of chemically bonded glucose molecules. But with resistant starch, they "clump" and thus keep the enzymes that digest it at bay. Like fiber, resistant starch increases bulk and transit time through the gastrointestinal tract, resulting in less caloric absorption. It also reduces damaging impact on the cells lining the colon, helping avoid the type of alteration which leads to cancer cell formation. But resistant starch also ends up in fermentation when it passes through the colon. In doing so, it acts as a powerful prebiotic. In turn, the beneficial gut bacteria it feeds increase digestive health and compete with harmful bacteria. The action of fermentation of resistant starch also stimulates the production by these probiotic gut bacteria of butyrate, an important short-chain fatty acid. Butyrate has been shown in studies to lower the incidence of colon and rectal cancer. Beyond that, studies have shown butyrate actually favorably alters expression of genetic markers related to cancer, curtailing the growth of abnormal cells. Another fermentation byproduct, acetate, ends up burned as energy in muscle and fat cells. Resistant starch has been shown in multiple research studies to lower both the glycemic and the insulin responses while encouraging a maintained release of energy. This is one way it reduces hunger and increases satiety. The fiberlike increase in bulk lends a feeling of fullness, and resulting slower absorption of glucose provides more even energy. And, research shows resistant starch alters the biochemical pathways of insulin, grehlin and leptin. These three are considered the main "hunger hormones." Resistant starch also raises the amount of glucagon-like peptide and PeptideYY, which slows gastric emptying. The two hormones are involved in communicating satiety from the gut to the brain. Studies have demonstrated that 25-30g of resistant starch daily reverses insulin resistance, even for people who have full-on type-2 diabetes. Also, resistant starch has been shown to actually aid the body in metabolism of fat, becoming, in essence, a fat-burning ingredient. Human studies showed up to one-fifth increase in fat oxidation with resistant starch. National Starch, now a part of Ingredion, has been the leading evangelist of resistant starch. The company developed its Hi-maize brand of resistant starch from high-amylose corn. Since then, a number of other ingredient suppliers have developed resistant starch from such sources as wheat, potatoes, legumes, even tapioca. The robot industry made its mark in the 1980s with hundred-unit installations in the auto industry that took difficult jobs (welding, heavy lifting) away from line workers with tireless efficiency. Few jobs in the food plant match that job description. But there are some. Nowadays, many food and beverage plants have at least one robot. It's probably toiling at the end of the line, stacking boxes of product onto pallets. Some plants have one a few feet upstream helping to fill those boxes with product. And there's a growing belief that any time you can remove human hands from the process, you can increase food safety and worker safety. Sanitary robotic assemblies suitable for a USDA washdown environment still need to be developed, and that work won't proceed without revenue assurances. "Companies can't spend $5 million for development and get one order," cautions Rick Tallian, segment manager-U.S. packaging robotics at ABB Inc., Auburn Hills, Mich.
Before joining ABB, Tallian was a systems integrator. He was involved in a seminal installation of SCARA (selective compliance assembly robotic arm) robots in 1987 in a Pepperidge Farm plant in Willard, Ohio. The main reason was ergonomic issues, which resulted in an OSHA fine for repetitive motion injuries incurred by workers feverishly stacking cookies into packages. Return on robotic investment is becoming easier to figure. Those first SCARA robots at Pepperidge Farm ran 55 cycles a minute, but cycle speeds increased 50 percent over the next decade. An even faster, cheaper solution didn't appear until the late 1990s, recalls Tallian, when Delta pick-and-place robots capable of 190 cycles a minute became available. That kick-started the food industry's embrace of the technology, he says. "We needed to know the end customer's focus and requirements; we needed a company like Pepperidge Farm to say, ‘We'll jump off the cliff with you' to develop the technology," Tallian asserts. The next breakthrough could be bin-picking machines that leverage 3-D vision technology from the gaming industry. If those systems could assemble products like Lunchables while also eliminating the need for infeed conveyors and other components of fixed automation, they could shrink the payback time for a new breed of bot. Managing Editor Kevin Higgins contributed to this article.